It is true that the field of physical therapy for musicians is obscure, but it has gained importance since famous musicians have begun to speak publicly about their physical health issues. Mentalities have slowly evolved. More and more musicians are paying attention to their bodies, and are looking for help: warm-up exercises for example. Musicians are demanding and disciplined, which has allowed physical therapy to respond effectively to their needs. Due to my work with Isabelle Perrin, professor of harp at the Ecole Normale de Musique de Paris, I have been able to learn much about the extremely complex techniques of harp playing. With Isabelle's encouragement, I even got a harp for my office! The goal is to find a physical balance between energy and relaxation, which is absolutely necessary to play an instrument. « Perfect posture; so natural I don't even need to think about it! » as one young harpist puts it. The harp is a very physical instrument; the feet work with seven pedals, the hands with forty-seven strings and the instrument leans on the right side of the body. Before discussing injuries, it must be understood that the instrument requires the whole body. Good posture is indispensable. It isn't so much the repetitive motions that cause muscular tissue trauma; what is dangerous is to execute them with reduced amplitude. A harpist's gestures should be as free as possible while remaining in the immediate space around the instrument. Hence the importance of the proper position of the harp. Eight out of ten harpists experience pain in the upper spinal column of the neck and in the shoulders, predominantly on the right side of the body, which experiences intense demands from the repertoire, particularly in the extremely tiring high register. The secret to good posture is found in four points of the body, which are often the source of muscular and skeletal problems. The head should rest on an axis that is the continuation of the spinal column. It should not be pushed forward. It should be free in order to facilitate looking right towards the strings and left towards the music and, in an orchestral setting, at the conductor. The ears must be free to listen. It is thus important that the instrument not be too close to the ear. 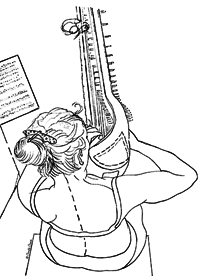 The instrument must rest in contact with the right shoulder but not with all of its weight, which could provoke sinking of the right shoulder. This may be associated with a red rash. The shoulder would have a tendency to slide down and back or, on the contrary, to roll forward creating a big rounded back. This would compromise the suppleness of the shoulder blade system. They would no longer be able to slide along the rib cage and would not continue to support the arms. The right shoulder is often painful, and the muscular tension is based in the spinal cord. The harp should therefore rest on the inner side of the knee and not on the right shoulder. Here the harp no longer rests on the shoulders beacause she is using her knees to help support the instrument. Harp well-positioned against the shoulder. The pelvis is stable. This harpist feels comfortable, she has found a good balance. 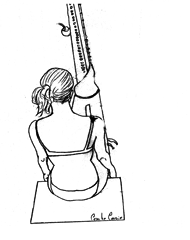 The harpist is put off balance by the weight of the instrument being applied on her shoulder. Harp too close to the face. Harp leaning too heavily on the right shoulder. Too much weight placed on the left side of the pelvis. This harpist is uncomfortable. The wrist should not push against the soundboard; it should simply be in contact with the wood. Otherwise, the elbow will have a tendency to work in a state of fatigue. Right elbow pain is quite frequent. The equilibrium of the hand is complex, especially the thumb. It works not only in opposition to the other fingers but also in synergy. The thumb must be well placed and disassociated from the fingers. It has its own muscular structure. The opposition of the thumb guarantees the enlargement of the arch of the palm, and vice versa. Unfortunately, the non-use of the little finger does not facilitate the equilibrium of the fingers. In your opinion, would you say there are points of contact and points of pressure? How to be comfortable in a seated position, away from the instrument? It is of prime importance to know how to sit well. Look for a dynamic sitting position. Everything is in the distribution of the body weight: 50% on each foot, and the same for the pelvis. Feel the axis of the torso distribute itself over the pelvic bones: the ischiums, without ever staying immobile on either of these rounded bones forming the base of the pelvis. This axis moves slightly inside a supportive polygon of suspension. I suggest sitting in the middle of the bench, slightly leaning forward as if you were ready to stand up. Regulate the height of the bench depending on the morphology of your body keeping in mind that it could also depend on the piece you will be playing. It is important not to be too close to the instrument. Arching the back to sit up straight is the most common mistake: putting no pressure on the feet, sitting at the edge of the bench, and straining to become taller. Arched like this, the head juts forward, which causes tension in the neck. While seated, the musician should imagine that he or she is sitting on a piece of paper and could at any moment lift him or her self up so that someone could remove it. This exercise uses the lower abdominal muscles and makes you aware of the feeling of energy in the base of the torso that it is necessary to maintain. With your pelvis as the fixed point, smoothly stretch your spine upward all the way to your head. But careful, this does not mean being stiff! Thus, this position is not passive pressure of the upper torso towards the bench. How to be comfortable in a seated position, with the instrument? Golden rule : « The harp must adjust to you, and not you to the harp ». Once the body has been positioned, and not before, pull the instrument toward yourself. Then consider the inclination of the harp and the new working space, as well as your space in relation to other musicians, if that is the case. When drawing the instrument toward yourself, before playing, never forget to think of the pelvis. It is the basis of stability. 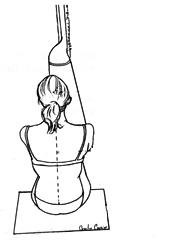 First the points of pressure of the pelvis must be stable, and then seek suppleness within the space of the instrument. There is only light contact between the harp and the right shoulder, thanks to the support from the knees. The head is free. When raised, the arms feel light. Working in a seated position without your instrument. The head is in the axis. The spinal column is stretched upward. Weight is evenly distributed over the pelvis. 2. Pull the instrument toward yourself and consider the inclination of the harp. The head should be relaxed and free to move amply. 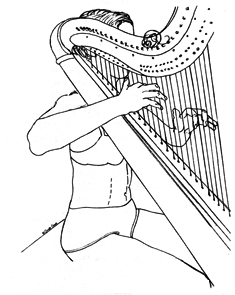 The harp is held by both knees. Simple contact. Stable pelvis. 3. Think of the pelvis. 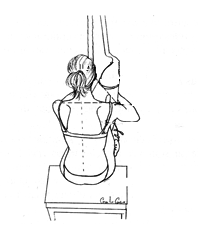 Work on global equilibrium in a seated position with the instrument leaning on the inner side of both knees. The head is not projected forward. The axis of the ear falls over the shoulder. Well-balanced shoulders. Shoulder blades well-positioned. Pelvis stable and relaxed. Always keep posture in mind when warming up with technique exercises; then when you begin to play and need to focus on the music and your work, you can stop thinking about posture. If you notice, however, that you are beginning to slouch, it's better to stop than to keep playing. When you feel that your body is becoming tired, don't ignore it! Good posture is never immobile; it must be understood that it is the continual movement of pressure points within the body. The harpist must therefore find a centre of balance with the instrument as well as his or her personal points of pressure in order to form equilibrium without tension. For me, finding the correct corporal sensations is the starting point to a proper posture. The abdominal muscles begin the exhalation, which must start from very low in the pelvis. The diaphragm is the vector of inhalation. Essentially, inhaling and exhaling depend on one another. 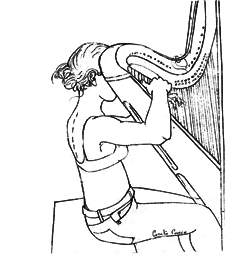 Suppleness in the rib cage is essential for the harpist, and it conditions the equilibrium of the shoulders. The two shoulder blades slide along the rib cage so that the hands can reach far on the strings. 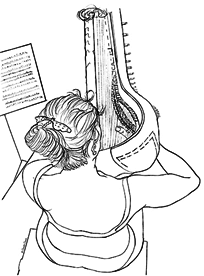 If the rib cage is tense either due to the pressure of poor posture or of the harp weighing on the right shoulder, the whole balance will be thrown off. 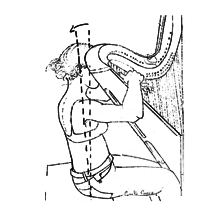 In a situation where the harpist is playing in the upper registers of the instrument, a common mistake is to arch the back moving the source of breath too far up the rib cage. This is a very tiring position that should be avoided. In order to allow proper relaxation in the arms and shoulders it is important to breathe with the diaphragm in a low position. If a teacher has a new student whose feet do not touch the floor, can he or she place an object below the student's feet in order to promote correct posture from the very beginning? I would say yes, but each child is different in their needs and how fast they grow. It should not be a systematic approach. It is true that certain children whose feet do not touch the floor naturally stretch their spine and support themselves with the abdominal muscles. Often these are children who hold themselves properly either through the efforts of their parents, through participation in a sport, or simply naturally. Such children can work without support under their feet depending on the fatigue of holding the instrument. However if a child is unable to find his or her own equilibrium, the teacher can help by providing this exterior aid. The support will be used by the student as an active pressure point for the feet, thus offering him or her a feeling of greater stability with the instrument. The teacher must always consider the morphology and the nature of the child. Nervous and tense children must work on relaxation without becoming mushy, while others who are flexible (and often double jointed) must work on healthy energetic tension without becoming stiff. It is therefore difficult to apply strict systematic rules. Harpists must learn to work on the muscle memory of their bodies. Learning an automatic gesture in order to improve sound production is done through anatomical and physiological muscle memory. What advice can you give to harp teachers? Many teachers have never had physical problems and therefore do not really understand the importance of having good posture. For them, the priority for their students is relaxation. For some, although their number is fortunately becoming increasingly rare, pain is a necessary aspect to playing, and is seen as proof of practice! No one is surprised when a sports team has a group of personal trainers. I advise teachers to do the same. Do not hesitate to ask the help of an outsider who will address the same problems but with a different vocabulary and perspective to that of the teacher. For example, a young harpist came to see me because she was experiencing excessive fatigue while playing. I advised her to see her doctor, who diagnosed her with scoliosis. Her fatigue was due to this disease, and I suggested that she fragment her practice time. Instead of playing for an hour and a half at a time, she should play forty-five minutes several times a day. She was able to correct her posture with the support of her teacher and specialized physical therapy. Today, despite her scoliosis, she is able to play the harp without fatigue because she has learned to manage her body properly. my second idea is to help teachers learn about the physiology of good posture. Their studies have not necessarily taught them the basics of anatomy and the physiology of movement. For example, a teacher was convinced that in order to breathe, one uses the belly in order to obtain relaxation. This is a widely found idea. I explained to her that the air actually goes in the lungs and not in the belly and taught her to use different body parts to promote proper breathing. Could you explain your work at the Ecole Normale de Musique de Paris? 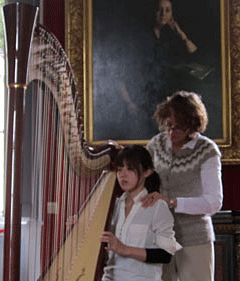 Isabelle Perrin, the harp professor, invites me to her class every month. I then see her students individually on Thursdays. When the student comes to see me I understand their problems and their teacher's objectives. No time is wasted and I go straight to the source of the problem. We have very good working conditions which allow me to follow the students' progress regularly throughout the year. The majority of the students, despite their high level of playing, have never worked with a physical therapist. Some of them have faults in their posture, which may be the source of problems since they are required to play six or seven hours a day. These faults act like a brake causing the student to stagnate in their technique. Rapid gestures require perfect dexterity in the hands. At the beginning of the year, Isabelle and I start with the basic rules of good posture. The students are future professionals and future professors; pedagogy is thus important. Each student plays in front of the class. The harpist may not necessarily even be aware of his or her faults due to the absence of pain. We fix the fault together. The presence of the professor is very important – it instills confidence in the student. The new posture is not always comfortable immediately since the reference points have been modified. The sound , however, is always freer. The sound the student has been looking for is produced with greater relaxation. The student must work on the new position for the next month. He or she may come and see me individually at the Ecole Normale. I verify that the student has not exaggerated in the corrections in his or her posture. I also give stretching and warm-up exercises as well as light massages in order to ease muscular tension. A month later, the class meets again. Often the first correction reveals another fault, which we then correct. Young 16-year-old harpist playing tirelessly in the upper range. Supple hips. Tonic abdominal muscles. The instrument leaning on the inner side of both knees. For example, once the balance of the pelvis is in place, the right shoulder may begin to slide down and back. The student is monitored all year. Our work on posture is very in-depth in the beginning of the year, and then we focus on balanced gestures. For example, allowing the thighs liberty of movement along with a flexible torso allows for greater amplitude, which helps the harpist to play comfortably in the lower registers. Slouching the back to play the low strings is to be avoided as the weight of the harp quickly tires the back. However, a rounded back with supporting abdominal muscles is a healthy position. As the year continues we help the harpists prepare for their exams. 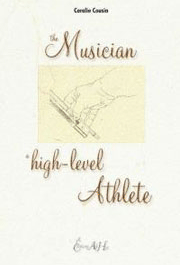 In order to succeed the harpist must be in the best possible physical shape, and train his or her body. Nothing is more satisfying than to see a musician the night before a competition; tired but with an athlete's body. As the exams approach we no longer talk about posture. At such a time we need to focus on the essentials; neither the therapist nor the teacher wish to correct faults, destabilizing the student. My role is to help the student be in the best shape possible. I give individual sessions on general physical wellness and I concentrate on relaxation of the breathing: massaging the diaphragm, relaxation of the neck, gentle stretching of the spine without brutal manipulations. These sessions of course are not too close to the date of the exam, the ideal time being a week before. I do not change the « instrumental technique » of the harpists. For example, for certain students come to France with a non-French technique. The goal is not to destabilize them; our goal is that they feel comfortable physically in order to improve. There is a very personal emotional relationship with the professor, which is to be expected since she represents Music. She gives advice, but the student is not always able to follow it. The physical therapist is disassociated from music. She explains things differently and the student understands he or she can arrive at the same results by a different route. The work we do together is very rewarding because it is oriented towards the prevention of physical pain despite six to eight hours at the harp. Feeling in shape allows the harpist to gain self-confidence in order to play to the best of his or her abilities. What is your goal in your work with musicians? In France, a lot of money is put towards healing and not enough towards prevention. It is an unfortunate reality, in stark contrast to the sports world where athletes retire millionaires at the age of 36! Yet, at the end of conferences on medicine in music, we all agree that success lies in one word: « Prevention » WHY? Musicians use several types of memory. We are interested in muscle memory. A musician is the first one to say that long hours of work and much repetition are needed in order to develop this type of memory and to make playing automatic. It is a memory that is stimulated at an early age when the brain is still absorbing a maximum amount of information. If a student begins with improper posture it will be very difficult to correct it at an adult age. In France, I have much admiration for the quality of the professors who teach while continuing an active artistic career with recitals, orchestra, and recordings. More and more heads of conservatories, orchestra directors, and festival organizers are asking for the participation of a physical therapist to educate their members about prevention - this did not exist twenty years ago. This idea is becoming more commonplace, but we still have a long way to go in comparison with the United States, where it is completely natural to take therapeutic classes (physical therapy, yoga, Alexander technique…) in parallel with music lessons. My goal is to share my passion for music. To know and to respect one's body allows the musician, over the years, to find harmony between his or her body and the instrument so that playing becomes a natural exercise. It must never be forgotten that each one of us has a different solution to a different problem, but that we are all aiming for the same thing: to transmit emotion through sound. Article written and illustrated by Coralie COUSIN. Interview conducted and compiled by Isabelle MARIE. 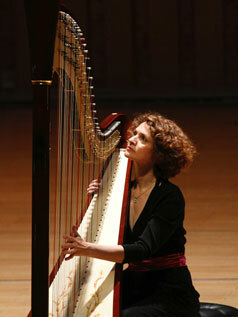 Isabelle Perrin - Concert Harpist, solist with the Orchestre National de Radio-France, Professor at the Ecole Normale de Musique in Paris. I began working with Coralie Cousin several years ago, because of a major problem with my back. I continue to collaborate with her as part of my work with my pupils at the Ecole Normale de Musique. This new approach to a musician's work in relation to the whole body and not just the fingers, seems to me to be an essential part of our physical wellbeing. This work enables us to find complete freedom in our movements as well as a much better approach to the sound we produce, the two being intimately linked. This should be taught to children from their very first contact with the instrument – it would avoid a large number of physiological problems in adulthood.